Liv sits through an interrogation for Lowell's murder. She's the prime suspect. The Lieutenant dismisses her, ruling the case a suicide. Ravi heads home to help Major, but he's convinced that Julien will turn up in the hospital. Clive finds Julien back at the gym, making Major's story less and less likely. Liv starts in on the murder of a journalist, Rebecca, who turns out to be a bit of an alcoholic. Ravi rules Lowell's death a suicide in an attempt to keep any more innocents from investigating Blaine and dying at his hands. Clive tells Major that Julien is fine, and they both start to suspect that Major needs to be institutionalized. 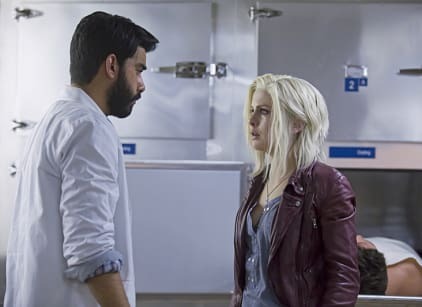 At the morgue, Liv drowns her sorrows, which makes it hard for Ravi to convince her to tell Major about zombies. Liv thinks checking into a mental hospital will keep him safe. A witness comes forward and admits that she helped convince a college student he murdered her as a joke, prompting his psychotic break. This was the story Liv's journalist was investigating. Liv discovers the kid was also a Max Rager addict. Major takes Liv home after a bender, and they share a moment. Clive takes their Max Rager evidence to his Lieutenant, but Liv goes straight to the CEO. She finds Rebecca's source, who begs her to save him. He tells her there's a second source inside Max Rager. The secretary who swiped the incriminating memo agrees to come forward, but Liv is kidnapped by the first source who turns out to be a fake. He kills the secretary and Liv only escapes him by raging out. She thinks she kills him, but he wakes up later on the beach as a zombie. In his mental hospital, Major relates to another patient who saw the same red eyes he did.